Vishnu is a Supreme God in Hinduism. Vishnu is known also as Narayana and Hari. He is venerated as the Supreme Being in Vaishnavism and as Purushottama or Supreme Purusha in ancient sacred texts like the Bhagavad Gita. The Vishnu Sahasranama declares Vishnu as Paramatman (supreme soul) and Parameshwara (supreme God). It describes Vishnu as the all-pervading essence of all beings, the master of—and beyond—the past, present and future, the creator and destroyer of all existences, one who supports,preserves, sustains and governs the universe and originates and develops all elements within. Vishnu is also venerated as Mukunda, Supreme God who is the giver of mukti or moksha (liberation from the cycle of rebirths) to his devotees, the worthy ones who deserve salvation from the material world. Vishnu is one of the Trimurti (meaning "three forms" of God), an iconographic representation of God in Hinduism, which depicts divinity as a three faced figure. These three faces represent God's roles of creation, preservation, and destruction, which are associated with Brahma (the source or creator), Vishnu (the preserver or indwelling-life), and Shiva (the destroyer and transformer) respectively. A 4th–6th century CE Sardonyx seal representing Vishnu with a worshiper. The inscription in cursive Bactrian reads: "Mihira, Vishnu (left) and Shiva". 12th century stone sculpture of God Vishnu flanked by two apsaras one with a fan (left) and the other with Tambura (right). The traditional explanation of the name Vishnu involves the root viś, meaning "to settle" (cognate with Latin vicus, English -wich "village," Slavic: vas -ves), or also (in the Rigveda) "to enter into, to pervade." Vishnu therefore means "the All-Pervading One". Shiva itself is the twenty-seventh and the six hundredth name in the Vishnu Sahasranama, the thousand names of Vishnu. Adi Sankara in his commentary on the Sahasranama states derivation from viś, with a meaning "presence everywhere" ("As he pervades everything, vevesti, he is called Vishnu"). Adi Sankara states (regarding Vishnu Purana, 3.1.45): "The Power of the Supreme Being has entered within the universe. The root viś means 'enter into'." Swami Chinmayananda, in his translation of Vishnu Sahasranama further elaborates on that verse: "The root vis means to enter. The entire world of things and beings is pervaded by Him and the Upanishad emphatically insists in its mantra 'whatever that is there is the world of change.' Hence, it means that He is not limited by space, time or substance. Chinmayananda states that that which pervades everything is Vishnu." Vishnu is also venerated as Mukunda, which means Supreme God who is the giver of mukti or moksha (liberation from the cycle of rebirths) to his devotees or the worthy ones who deserve salvation from the material world. Vishnu is held by many to be the Vedic Supreme God in Hinduism. He is venerated as the Supreme Being in Vaishnavism and as Purushottama or Supreme Purusha in ancient sacred texts like the Bhagavad Gita. The Trimurti (three forms) is a concept in Hinduism "in which the cosmic functions of creation, maintenance, and destruction are personified by the forms of Brahma the creator, Vishnu the maintainer or preserver, and Shiva the destroyer or transformer." Of the three members of the Trimurti, the Bhagavata Purana, which espouses the Vaishnavite viewpoint, claims that the greatest benefit can be had from worshiping Vishnu. 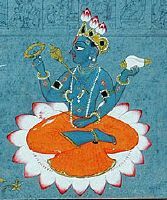 In Hindu sacred texts, Vishnu is described as having the divine blue color of water-filled clouds and as having four arms. 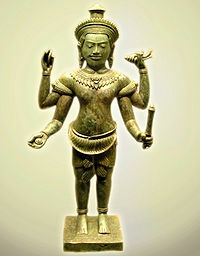 He is depicted as holding a padma (lotus flower) in the lower left hand, a unique type of mace used in warfare known as a Kaumodki gada in the lower right hand, a Panchajanya shankha (conch) in the upper left hand and a discus weapon Sudarshana Chakra in the upper right hand. Vishnu is also described in the Bhagavad Gita as having a 'Universal Form' (Vishvarupa or Viraat Purusha) which is beyond the ordinary limits of human perception or imagination. Vishnu's eternal and supreme abode beyond the material universe is called Vaikuntha, which is also known as Paramdhama, the realm of eternal bliss and happiness and the final or highest place for liberated souls who have attained Moksha. Vaikuntha is the celestial home of Vishnu, situated beyond the material universe, and hence cannot be perceived or measured by material science or logic. Vishnu's other abode within the material universe is Ksheera Sagara (the ocean of milk), where he reclines and rests on Ananta Shesha, (the king of the serpent deities, commonly shown with thousand heads). 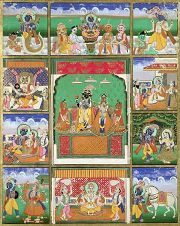 In almost all Hindu denominations, Vishnu is either worshiped directly or in the form of his ten avatars, the most famous of whom are Rama and Krishna. The Puranabharti, an ancient text, describes these as the dashavatara, or the ten avatars of Vishnu. Among the ten described, nine have occurred in the past and one will take place in the future as Lord Kalki, at the end of Kali Yuga, (the fourth and final stage in the cycle of yugas that the world goes through). These incarnations take place in all Yugas in cosmic proportions; the avatars and their stories show that gods are indeed beyond imagination, beyond thought, and beyond concept. The Bhagavad Gita mentions their purpose as being to rejuvenate dharma, to vanquish those negative forces of evil that threaten dharma and also to display His divine nature before all souls "... at that time I descend Myself." Shruti is considered to be of solely divine origin. It is preserved as a whole, not verse by verse. It includes the four Vedas (Rigveda, Yajurveda, Samaveda and Atharvaveda) the Brahmanas, the Aranyakas and the Upanishads, commentaries. Smriti refers to all the knowledge derived and inculcated after Shruti is received. Smriti is not 'divine' in origin, but is'remembered' later by rishis (sages by insight, scribes). It is received transcendental means and passed down though their followers. It includes the Bhagavata Purana and the Vishnu Purana, Sattva Puranas. Both declare Vishnu as Para Brahman, Supreme Lord who creates unlimited universes and enters each one as Lord. The Vaishnava canon presents Vishnu as the supreme being, not as another name for the Sun God, Suryanarayana. Suryanarayana is only a form of Vishnu. Lord Narayana is mentioned as the supreme being in the Yajurveda, Taittiryia Aranyaka (10-13-1), Narayana sukta. The first verse of Narayana sukta mentions the words "paramam padam" which literally means "highest post" and may be understood as the "supreme abode for all souls." This also is known as Paramdhama, Paramapadam, or Vaikuntha. Rigveda 1:22:20a also mentions "paramam padam." This indicates the possibility that Narayana and Vishnu are alternate names for the same god, thus establishing his supremacy. Narayana also is one of the thousand names of Vishnu mentioned in the Vishnu Sahasranama. It describes Vishnu as the All-Pervading essence of all beings, master of—and beyond—the past, present and future, one who supports, sustains and governs the Universe and originates and develops all elements within. This illustrates the omnipresence of Vishnu. Vishnu governs the aspect of preservation and sustenance of the universe. He is called "Preserver of the universe." Vishnu is the Supreme God who takes on manifest forms or avatars in various ages or periods to save humanity from evil beings, demons or asuras. These are the figures who gained power by receiving boons from Brahma and Shiva. 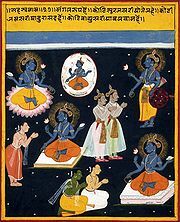 Hindu texts and traditions consider Lord Vishnu to be resident in the sector of "Makara Rashi" (the "Shravana Nakshatra"), approximately coincident with the Capricorn constellation. In some Puranas and Vaishnava traditions, Vishnu's eye is considered to be situated at the infinitely distant Southern Celestial Pole. Following the defeat of Indra and his displacement as the Lord of Heaven or Swarga, Vishnu takes his incarnations or avatars to Earth to save humanity, taking the place of the Supreme God, winning recognition by Shaivites and Smarthas. In the Puranas, Indra frequently appears proud and haughty. These attributes incur his creator (Brahma)'s wrath, who along with Shiva, start giving boons to demons or asuras such as Hiranyaksha, Hiranyakashyapu and Ravana, who are then able to defeat Indra in wars between the devas and asuras. The boons enabled the demonic asuras to be virtually indestructible. Indra has no option but to seek help from Vishnu. Indra prays to Vishnu for protection. The Supreme Lord obliges him by taking avatars and taking on various forms on Earth, first as a water-dweller (Matsya, fish), then as an amphibious creature (Koorma avatar or Tortoise), and then as a half-man, half-animal (Varaha the pig-faced, human-bodied Lord and Narasimha the Lord with lion face and claws and human body). Later Vishnu appears as human beings (Vamana the short-heighted person), Parashuram, Ram, Krishna, Balarama and finally as Kalki avatar for the purpose of performing his task of protecting his devotees from the asuras or anti-God, anti-religious entities. Ravana is the greatest of Shiva's devotees, but is slain by Vishnu, who appears before him as Lord Rama, the son of Dasharatha. Vishnu's supremacy is attested to by his victories over powerful entities who themselves are devotees of other Gods such as Brahma or Shiva. This is seen in accepted iconography and sculptures of Vishnu, which show him reclining with Brahma emerging from with his navel. Brahma the creator therefore is created by Vishnu out of his own person. Same for Shiva, Son of Brahma (according to Bhagavata Purana). Vishnu takes various avatars to slay and defeat demons. Since Shiva and Brahma cannot distinguish between good and evil beings, they have to entrust this responsibility to Vishnu. Vishnu never grants a wish to evil beings. Vishnu's actions diminish Indra's rank among Hindu deities, while revealing Vishnu's ascendancy of . Few temples are dedicated to the Sun or Suryanarayana, nor indeed Indra. In general Indra does not figure that prominently in the Hindu pantheon. Indra was almost completely absent from among those deities considered central. Suryanarayana, a minor deity, also was absent. Vishnu is mentioned 93 times in the Rigveda. He is invoked frequently among other deities, especially Indra, whom he helps to kill Vritra, and with whom he drinks soma. His distinguishing characteristic in the Vedas is his association with light. Two Rigvedic hymns in Mandala 7 are dedicated to Vishnu. In 7.99, Vishnu is addressed as the god who separates heaven and earth, a characteristic he shares with Indra. 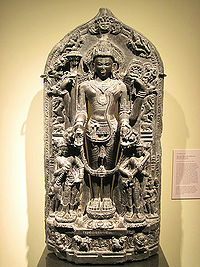 The Rigveda describes Vishnu as subordinate to Indra as Vamana. In Vaishnava canon the 'Vishnu' who is subordinate to Indra is identified as Vamana, Vishnu's fifth avatar, and who is referred to as Vishnu by Vaishnavites. Vishnu is not a mere sacrificial deity; he is the Supreme God who lives in the highest celestial region, compared with those who live in the atmospheric or terrestrial regions. Vishnu is content with mere prayer, unlike almost all of the other gods who receive sacrificial offerings such as havis, which is clarified butter or ghee, or soma. Wilson mentions Griffith's possible translation as a footnote. However the following verse from Rigveda renders the above translation by Wilson more probable. This verse sees Vishnu as one glorified by his own strength, while Indra became deserving of honor after having slain Vrtra only in association with other gods. Viṣṇu, the mighty giver of dwellings praises thee, and Mitra and Varuna; the company of Maruts imitates thee in exhilaration. (Rigveda 8:15:9) (page 280). The following verses categorically show Vishnu as distinct from other gods in Rigveda. He who presents (offering) to Viṣṇu, the ancient, the creator, the recent, the self-born; he who celebrates the great birth of that mighty one; he verily possessed of abundance, attains (the station) that is to be sought (by all). (Rigveda 1:156:2) (page 98). No being that is or that has been born, divine Viṣṇu, has attained the utmost limit of thy magnitude, by which thou hast upheld the vast and beautiful heaven, and sustained the eastern horizon of Earth. (Rigveda 7:99:2) (page 196). Jan Gonda, the late Indologist, states that Vishnu, although remaining in the background of Indra's exploits, contributes by his presence, or is key to Indra's success. Vishnu is more than a mere companion. Vishnu is equal or excels in rank or power to Indra. Vishnu makes Indra's success possible. Descriptions of Vishnu as subordinate to Indra are found only in hymns to Indra, but in a kathenotheistic religion like that of the Rigveda, each god, for a time, is supreme in the mind of the devotee. Vishnu with his consort Lakshmi resting on Shesha Naga from The Atha Naradiyamahapuranam. The Naradeya Purana describes the mechanics of the cosmos. Narada and Brahma are also pictured. In the Rig Vedic texts, the deity or god referred to as Vishnu is the Sun God, who also bore the name Suryanarayana. By contrast the 'Vishnu' referred to in 'Vishnu Puranam', 'Vishnu Sahasranamam' and 'Purusha Sooktham' is Lord Narayana, the Consort of Lakshmi. The Vaishnavites make a further distinction by extolling the qualities of Vishnu by highlighting his differences from other deities such as Shiva, Brahma or Surya. Griffith's "princes" are the sūri, either "inciters" or lords of a sacrifice, or priests charged with pressing the Soma. The verse is quoted as expressing Vishnu's supremacy by Vaishnavites. In hymns 1.22.17, 1.154.3, 1.154.4 he strides across the earth with three steps, in 6.49.13, 7.100.3 strides across the earth three times and in 1.154.1, 1.155.5,7.29.7 he strides vertically, with the final step in the heavens. The same Veda also says he strode wide and created space in the cosmos for Indra to fight Vritra. By his stride he made dwelling for men possible, the three forming a symbolic representation of the dwelling's all-encompassing nature. This nature and benevolence to men were Vishnu's enduring attributes. As the triple-strider he is known as Tri-vikrama and as Uru-krama, for the strides were wide. 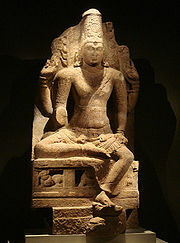 Four-armed Vishnu, Pandya Dynasty, 8–9th century CE. The Brahmanas are commentaries on the Vedas that form part of Shruti literature that focus on details and proper performance of rituals. In the Rigveda, Shakala shakha: Aitareya Brahmana Verse 1 declares that: agnir vai devānām avamo viṣṇuḥ paramas, tadantareṇa sarvā anyā devatā - Agni is the lowest or youngest god and Vishnu is the greatest and the oldest God. The Brahmanas assert the supremacy of Lord Vishnu, addressing him as "Yajnapati," the one whom all sacrifices are meant to please. Lord Vishnu accepts all sacrifices to the demigods and allots the respective fruits to the performer. In one incident a demonic person performed a sacrifice by abducting the rishis (sages), who meditate by constantly chanting God's name). The sacrifice was meant to destroy Indra. But the rishis, who worshipped Indra as a demigod, altered one pronunciation of the ved-mantra, reversing the purpose of the sacrifice. When the fruit of the sacrifice was given and the demon was on the verge of dying, he calls to Vishnu, whom he addresses as Supreme Godhead and "the father of all living entities including himself." Aitareya Brahmana 1:1:1 mentions Vishnu as the Supreme God. But in the Vaishnava canon, in different ages, with Vishnu in different avatars, his relationship with the asuras or demons, was always adversarial. Asuras always cause harm, while sages and devas (celestial beings), did penance and called to Vishnu for protection. Vishnu always obliged by taking an avatar to vanquish the asuras. In the Vaishnava canon, Vishnu never gave or granted boons to the asuras, unlike the gods Shiva and Brahma, who did. Vishnu is the only God called upon to save good beings by defeating or killing the asuras. Vishnu belongs to Satriyan group and is not a Brahmana. Sayana writes that in Aitareya Brahmana 1:1:1 the declaration agnir vai devānām avamo viṣṇuḥ paramas,tadantareṇa sarvā anyā devatā does not indicate any hierarchy among gods. Even in Rigveda Samhita, avama and parama are not applied to denote rank and dignity, but only to mark place and locality. In Rigveda 1:108:9,: yadindrāghnī avamasyāṃ pṛthivyāṃ madhyamasyāṃ paramasyāmuta sthaḥ | i.e., in the lowest place, the middle (place), and the highest (place). Agni, the fire has, among the gods, the lowest place; he resides with man on the earth; while the other gods are either in the air, or in the sky. Vishnu occupies the highest place, representing the sun. The words avama and parama are understood as 'First' and 'Last' respectively. To support this claim, Sayana adduces the mantra (1,4. As'val. Sr. S. 4, 2), agnir mukham prathamo devatanam samgathanam uttamo vishnur asit, i.e., Agni was the first of the deities assembled, (and) Vishnu the last. In the Kausitaki Brahmana (7.1) Agni is called avarardhya (instead of avama), and Visnu parardhya(instead of parama),i.e., belonging to the lower and higher halves (or forming the lower and higher halves). The Vishnu Purana gives tremendous importance to the worship of Vishnu and mentions that sacrifices are to begin only with both the lighting of fire or 'Agni', pouring of sacrificial offerings to Vishnu in 'Agni' so that those offerings reach and are accepted by Vishnu. Worship of Vishnu through Yagnyas (or Homams) and other rituals, will not achieve the desired result if 'Agnis role is neglected. Muller says "Although the gods are sometimes distinctly invoked as the great and the small, the young and the old (Rigveda 1:27:13), this is only an attempt to find the most comprehensive expression for the divine powers, and nowhere are any of the gods represented as the slave of others. It would be easy to find, in the numerous hymns of the Veda, passages in which almost every single god is represented as supreme and absolute." It can be argued that this notion is not completely correct as per the following verse, which shows Rigveda describing one or more gods as subject to other god(s). The following verse suggests Rudra gaining his strength from worship of Viṣṇu. The Vishnu Smriti, Viṣṇu Smṛti (700–1000 C.E.) is one of the later books from the Dharmashastra tradition of Hinduism, and the only one that focuses on the bhakti tradition and the puja to Vishnu required daily, rather than the means of knowing dharma. It is also known for handling controversial subject of sati (self-immolation of a widow on her husband’s funeral pyre). The text was composed by an individual or group, writing long after Vishnu's death. The author(s) created a collection of the commonly known legal maxims that were attributed to Vishnu into one book, as Indian oral culture began to be recorded more formally. Vishnu is the only Bhagavan. This is declared in the Bhagavata 1:2:11 in the verse: vadanti tat tattva-vidas tattvam yaj jnanam advayam brahmeti paramatmeti bhagavan iti sabdyate, translated as "Learned transcendentalists who know the Absolute Truth call this nondual substance Brahman, Paramātma and Bhagavan." "The substantives of the word bhagavat (bhagavat-śabda-vācyāni) are unlimited (aśeṣataḥ) knowledge (jñāna), energies (śakti), strength (bala), opulence (aiśvarya), heroism (vīrya), splendor (tejas), without (vinā) objectionable (heyair) qualities (guṇādibhiḥ)." Tejas (Splendor), self-sufficiency and the capacity to overpower everything by spiritual effulgence. Other important qualities attributed to Vishnu are Gambhirya (inestimatable grandeur), Audarya (generosity), and Karunya (compassion). Natya Shastra lists Vishnu as the presiding deity of the Sringara rasa. The Rigveda says: Vishnu can travel in three strides. The first stride is the Earth. The second stride is the visible sky. The third stride cannot be seen by men and is the heaven where the gods and the righteous dead live. (This feature of three strides also appears in the story of his avatar Vamana called Trivikrama.) The Sanskrit for "to stride" is the root kram; its reduplicated perfect is chakram (guņa grade) or chakra (zero-grade), and in the Rigveda he is called by epithets such as vi-chakra-māņas = "he who has made 3 strides." The Sanskrit word chakra also means "wheel." That may have suggested the idea of Vishnu carrying a chakra. 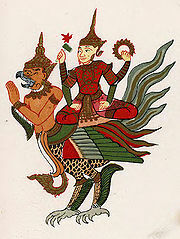 Vishnu (Beikthano in Burmese) on his mount, the garuda, in the traditional Burmese depiction. In the Para Form, Para is the highest form of Vishnu found only in Sri Vaikunta also called Moksha, along with his consort Lakshmi, (and Bhumi Devi and Nila devi, avatars of Lakshmi) and surrounded by liberated souls like Ananta, Garuda, and a host of Muktas (liberated souls). In the Vyuha form, Vishnu assumes four forms, which exercise different cosmic functions and controls activities of living beings. In the Vibhava form, Vishnu assumes various manifestations, called Vibhavas, more popularly known as Avatar from time to time, to protect the virtuous, punish evil-doers and re-establish righteousness. In the Antaryami; "Dwelling within" or "Suksma Vasudeva" form, Vishnu exists within the souls of all living beings and in every substance. installed by humans, and consecrated according to Vaishnava Agama shastras or scriptures such as Lord Jagannath of Jagannath Temple (Puri) at Puri. The three gods of the Trimurti, are inseparable and in complete harmony in their common vision and participation in universal good. There is no disagreement among them. They are perfect and ideal in all respects. Although their names were mentioned in the Vedas, both Vishnu and Shiva played relatively minor roles, but by the time of the Brahmanas,(the commentaries on the four Vedas), both had gained ascendancy. By the Puranic period, both deities had major sects of devotees, which created a schism. Both Apsaras and Devas played supportive roles in this story by keeping company with Vishnu in his incarnated forms. Hanuman is the vanara who is completely dedicated to Rama. He gives Vishnu company and obeys his command, playing an important part in Rama's life. He is highly regarded in Vaishnava canon because it is through blessings that Hanuman is born. Thus, Hanuman, Vishnu's constant companion, with his idol appears in temples of Rama, Krishna and Narasimha. These all are avatars of Vishnu, and all highly considered by Vaishnavas. Syncretic forces produced stories in which the two deities were shown in cooperative relationships and combined forms. Harihara is the name of a combined deity form of both Vishnu (Hari) and Shiva (Hara). This dual form, which is also called Harirudra, is mentioned in the Mahabharata. Vishnu with Lakshmi (Lakshmi-Narayana) at Halebidu. Vishnu's consort is Lakshmi the goddess of wealth also known as Maya. The samvit (the primary intelligence) dark matter of the universe is Vishnu, while the other five attributes emerge from this samvit and hence Maya or dark energy of the universe is Lakshmi, his ahamata, activity, and his Power.This power of God, Maya or Shakti, is personified and has multiple names: Parvathi, Saraswathi, Shree, Lakshmi, Maya, Vishnumaya,and Mahamaya. She is said to manifest as kriyashakti, (Creative Activity) and bhutishakti (Creation). This world requires Vishnu's creativity. He therefore needs Lakshmi always to be with Him. Her various avatars as Lord Vishnu's or Shiva's consort are Varahavataram (Bhudevi) or Bhumi, Ramavataram Sita, Krishnavataram (Radha and Rukmini) and Venkateswara (Padmavathi Vedavati). Vishnu's mount (vahana) is Garuda, the eagle. 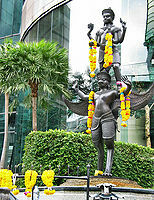 Vishnu is commonly depicted as riding on his shoulders. He has four arms and is male: The arms indicate his all-powerful and all-pervasive nature. His physical existence is represented by the two arms in the front, while the two arms at the back represent his presence in the spiritual world. The Upanishad Gopal Uttartapani describes the four arms. The srivatsa mark is on his chest, symbolising his consort Lakshmi. He wears the auspicious "Kaustubha" jewel around his neck and a garland of flowers (vanamaalaa). Lakshmi dwells in this jewel, on Vishnu's chest. A crown adorns his head: The crown symbolizes his supreme authority. This crown sometimes includes a peacock feather, borrowing from his Krishna avatar. He wears two earrings: The earrings represent inherent opposites in creation —knowledge and ignorance; happiness and unhappiness; pleasure and pain. He rests on Ananta, the immortal and infinite snake. A conch shell or Shankha, named Panchajanya, is held by the upper left hand. It represents Vishnu's power to create and maintain the universe. Panchajanya represents the five elements or Panchabhoota – water, fire, air, earth and sky or space. It also represents the five airs or Pranas that are within the body and mind. The conch symbolizes that Vishnu is the primeval Divine sound of creation and continuity. It also represented as Om. In the Bhagavad Gita, Krishna avatara states that of sound vibrations, 'He is Om'. The chakra, a sharp-spinning discus-like weapon, named "Sudarshana," is held by the upper right hand. It symbolizes the purified spiritualized mind. The name Sudarshana is derived from two words – Su, which means good, superior, and Darshan, which means vision or Sight; together, it is "Superior Vision." The chakra represents destruction of ego in the awakening and realization of the soul's original nature and god, burning away spiritual ignorance and illusion, and developing higher spiritual vision and insight to realize god. A mace or Gada, named "Kaumodaki," is held by the lower right hand. It symbolizes that Vishnu's divine power is the source of all spiritual, mental and physical strength. It also signifies Vishnu's power to destroy materialistic or demonic tendencies (anarthas) that prevent people from reaching god. Vishnu's mace is the power of the Divine within us to spiritually purify and uplift us from our materialistic bonds. A lotus flower or Padma is held by the lower left hand. It represents spiritual liberation, Divine perfection, purity and the unfolding of Spiritual consciousness within the individual. The lotus opening its petals in the light of the Sun indicates expansion and awakening of our long dormant, original spiritual consciousness in the light of god. The lotus symbolizes that god is the power and source from which the universe and the individual soul emerges. It also represents Divine Truth or Satya, the originator of the rules of conduct or Dharma, and Divine Vedic knowledge or jnana. The lotus also symbolizes that Vishnu is the embodiment of spiritual perfection and purity and that He is the wellspring of these qualities and that the individual soul must seek to awaken these intrinsic Divine qualities from Vishnu by surrendering to and linking with Him. To this, other symbols may be added, the vanamaala flower garland, Vishnu's bow (Shaarnga) and his sword Nandaka. A verse of the Vishnu Sahasranama stotram states;vanamālī gadhī shārngī shanki chakri cha nandaki / shrīmān nārāyaņo vişņo vāsudevo abhirakşatu//; translation: Protect us Oh Lord Narayana who wears the forest garland,who has the mace, conch, sword and the wheel. And who is called Vishnu and the Vasudeva. Standing on a lotus flower, often with Lakshmi, his consort, beside him on a similar pedestal. 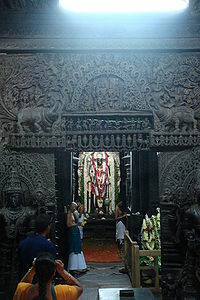 Reclining on the coiled-up thousand-hooded Shesha Naga, with Lakshmi seated at his feet; the assemblage rests on the "Kshira Sagar" (ocean of milk). In this representation, Brahma is depicted as sitting on a lotus that grows out of Vishnu's navel. Riding on the back of his eagle mount, known as Garuda. Another name for Garuda is "Veda atma"; Soul of the Vedas. The flapping of his wings symbolizes the power of the Divine Truth of Vedic wisdom. Also the eagle represents the soul. 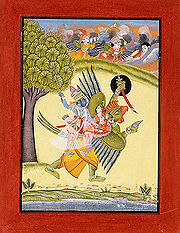 Garuda carrying Vishnu symbolizes the soul or jiva atma carrying the Super soul or Param atma within it. Vishnu reclining on the Shesha Naga with his consort Lakshmi massaging his feet. Matsya, the fish that kills Damanaka to save the vedas and saves mankind. Kurma, the turtle that helps the Devas and Asuras churn the ocean for the nectar of immortality. Varaha, the boar that rescues the Earth and kills Hiranyaksha. Narasimha, the half-lion half human, who defeats the demon Hiranyakashapu -nara(man), simha (lion). Vamana, the dwarf that grows into a giant to save the world from King Bali. Parashurama, "Rama of the battle axe," a sage who appeared in the Treta Yuga. He killed Kartavirya Arjuna's army and clan and then killed all the ksatriyas 21 times. 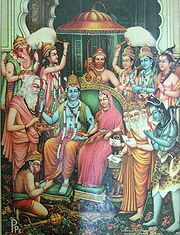 Rama, Sri Ramachandra, the prince and king of Ayodhya who killed Demon King Raavan. Balarama, The elder brother of Krishna and considered the eighth avatar of Vishnu in puranic texts (also depicted in most ancient paintings / murals as shown on the painting on the right from the Victoria and Albert Museum. In some modern interpretations, however, Krishna is considered the eighth avatar and the Buddha the ninth. Krishna, the ninth Avatar of Vishnu and associated with the Dwapara Yuga. Kalki, the tenth avatar of Vishnu and said to be the harbinger of the end of Kali Yuga. This is the only avatar of Vishnu that is yet to manifest itself. Some versions of the above list include Hayagriva among the Dashavataras. Another 22 avatars are given in Chapter 3, Canto 1 of the Bhagavata Purana, although it states that "the incarnations of the Lord are innumerable, like rivulets flowing from inexhaustible sources of water." Vishnu sahasranama manuscript, c. 1690. Vishnu's many names and followers are collected in the Vishnu sahasranama, (Vishnu's thousand names) from within the larger work Mahabharata. The character Bhishma recites the names before Krishna on the battlefield of Kurukshetra, praising him (Vishnu) as the supreme god. These Sahasranama are regarded as the essence of all Vedas by followers of Vaishnavism, who believe sincere chanting of Vishnu Sahasranama results in spiritual well-being and a greater awareness of God. Shikhandee—He who wears a peacock feather. Sriman—the pride of Shri or Lakshmi); Often Sriman is combined with the name, Narayana, to form a compound word, Sriman Narayana. Srinivasa—the abode of Shri) (also specifically referring to his form in the temple at Tirupati). Also the form of Vishnu at Tirupati is well known as Venkateswara. Jagannath—Lord of Jagat or the World. ↑ Swami Chinmayananda, Vishnu Sahasranama/thousand ways to transcendental (Mumbai, India: Central Chinmaya Mission Trust, 2002, ISBN 978-8175972452), 16–17. ↑ Name 515 in Vishnu Sahasranama Retrieved August 16, 2013. ↑ Bhagavata Purana (12.12.56): "narayanam devam adevam isam - Lord Narayana (Vishnu), the supreme controller and the ultimate Soul of all existence, beyond whom there is no other god. ↑ Freda Matchett, "The Purāṇas," in Gavin Flood (ed.) The Blackwell Companion to Hinduism (Wiley-Blackwell, 2005). ↑ Srimad Bhagavatam Canto 1 Chapter 2 Verse 23 Retrieved August 19, 2016. ↑ The Vision of the Universal Form Chapter 11 Verse 3 Retrieved August 19, 2016. ↑ 9.0 9.1 Anna L. Dallapiccola, Dictionary of Hindu Lore and Legend (Thames & Hudson, 2004, ISBN 978-0500284025). ↑ Freda Matchett, Krsna: Lord or Avatara? : The Relationship Between Krsna and Visnu (Routledge, 2000, ISBN 978-0700712816). ↑ Bhagavad Gita 4.7 Retrieved August 16, 2013. ↑ Sri Vishnu Sahasaranama – Transliteration and Translation of Chanting Retrieved August 16, 2013. ↑ Hart de Fouw and Robert Svoboda, Light on Life: An Introduction to the Astrology of India (Lotus Press, 2003, ISBN 978-0940985698). ↑ David Gordon White, Sinister Yogis (University Of Chicago Press, 2011, ISBN 978-0226895147). ↑ 17.0 17.1 17.2 17.3 17.4 17.5 17.6 17.7 Nilakanta Sastri, Advanced History of India (New Delhi: Allied Publishers, 2000). ↑ 18.0 18.1 H.G. Narahari, Atman in Pre-Upanisadic Vedic Literature (Narahari Press, 2007, ISBN 978-1406753172). ↑ 19.0 19.1 19.2 Rig-veda Sanhitá: a collection of ancient Hindu hymns Volume 4 translated by H.H. Wilson, 269. Retrieved August 17, 2013. ↑ Rig-Veda Book 1: HYMN CLIV. Viṣṇu translated by Ralph T.H. Griffith, Sacred-texts.com. Retrieved August 17, 2013. ↑ Regveda Volume 6, 318–319. Retrieved August 17, 2013. ↑ 22.0 22.1 Regveda Volume 2 Retrieved August 17, 2013. ↑ Max Muller, History of Ancient Sanskrit Literature (South Asia Books, 1993, ISBN 978-8120605541), 533. ↑ Rigveda 2:38. Savitar Sacred-texts.com. Retrieved August 17, 2013. ↑ Rigveda 7:40. Viśvedevas Sacred-texts.com. Retrieved August 17, 2013. ↑ Patrick Olivelle, "The Date and Provenance of the Viṣnu Smṛti," Indologica Taurinensia 33 (2007): 149–150. ↑ Richard W. Lariviere (trans. ), The Naradasmrti (Motilal Banarsidass, 2001). ↑ Bhaktivedanta VedaBase: Śrīmad Bhāgavatam 1.2.11 Retrieved August 19, 2016. ↑ Swami Tapasyananda, Bhakti Schools of Vedanta (Ishi Press, 2011, ISBN 978-4871876520). ↑ Subhamoy Das, The 10 Avatars of Vishnu About.com. Retrieved August 21, 2013. All links retrieved August 19, 2016. This page was last modified on 20 August 2016, at 22:22.